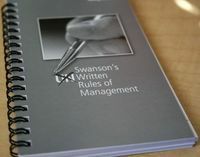 Den nionde lagen i Swanson’s ”Unwritten rules of management” tar vikten av uthållighet och att slutföra saker. Uthålligt och viljan att gå ”the extra mile” är en av nycklarna till excellens, vilket stöds av många andra ordspråk som t.ex. att 80% av skillnaden görs på de sista 20%:en. Samtidigt påpekar han vikten av av att aldrig säga ”aldrig” som är en varningsflagg för många av oss chefer. Persistence or tenacity is the disposition to preserve in spite of difficulties, discouragement or indifference. Don’t be known as a good starter but a poor finisher! There is often a wonderful excitement when starting something new. It is important to maintain that passion throughout the course of an assignment, especially when difficulties ariese or the project encounters negative thinkers or those who lack the commitment to persevere. We all want to get new projects off to a strong start, but it is equally important to stay engaged throughout the process – to push the project forward when necessary, especially as it nears the finish line. Good process will help immeasurably, but so will your passion to see the project to fruition. For me, and for many general managers, the red flag word is ”never”. Don’t say you will ”never” be able to overcome the obstacles – unless you have truly analyzed each obstacle and demonstrad in a fact-based way that they are truly insurmountable. ”Never” is the ultimate challenge to me.